Despite the snowy, rainy weather we’ve been having lately,we were fortunate to have a dry day under overcast skies. Mary and Terry Lumsden, owners of Mill Street Books gave us a warm welcome and introduced us to our fellow story-teller Rob Newton. Rob and his wife Sharon have produced a fascinating film titled “Almonte’s Inverwoven Past” which captures some of the rich history of the community and features many interviews with the town’s residents and historians. I was delighted to have a visit with a distant cousin Florence Ling who stopped by to purchase “Lanark County Chronicle” and we had a chance to get caught up and share some updates on each other’s genealogical research. Florence is related through our McGarry ancestors from County Westmeath, Ireland. We also had a lovely chat with some folks from Huntley Township and were fascinated to hear their genealogical connection with the family of hockey player Jean Beliveau. Finally, following our time at the book store we caught up with old friend Wendy Gervais, owner of Divine Consign on Industrial Avenue in Almonte. She is celebrating the first anniversary of the store and we wanted to congratulate her on her success! Divine Consign has a lovely selection of designer clothing and shoes and home accessories as well. She also carries some select book titles and will now be stocking ‘Recipes and Recollections’, ‘Lanark County Chronicle’ and ‘Lanark County Kid’. After closing hours, Wendy met up with us and we sampled some food at the nearby J.R.’s Restaurant and Downstairs Pub. Their servings were generous and staff was attentive. Another gem in Almonte! We look forward to returning to Almonte again this summer and have already began discussions with Mary of Mill Street Books for another Story-Teller event. Thank-you again Mary and Terry for your kind hospitality today and for hosting the event! 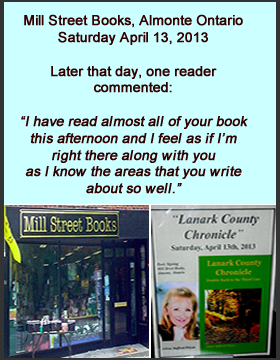 This entry was posted in Author Events & Book Signings and tagged almonte book store, Arlene Stafford-Wilson, lanark county book store, Lanark County Chronicle, Mississippi Mills book store.